Chinchillas will be happiest when you provide an environment that meets their needs and doesn't cause unnecessary stress. By their nature, they don't like loud noises or a lot of movement. Such things will scare them causing them to remain in their cage. Even something seemingly innocent as a rain shower can seem scary to a chinchilla. As such, you'll want to keep them away from young children and other pets. Although chinchillas can live in a cage, they will be healthiest if given a room or hallway to run in for a few hours each night. This gives them an opportunity to explore and to get some exercise beyond what a wheel can provide. Ideally, their cage should be up against a wall or in a corner. Doing so will provide your chinchillas a sense of safety especially if their sleeping box is also in the corner with the opening facing the wall. Speaking of wheels, every chinchilla cage should have one. Getting a wheel big enough for a chinchilla can take a little searching, but they do exist. We prefer wheels that are solid so that our chinchilla's feet don't slip through the bars. Being from the Andes, chinchillas are used to cooler temperatures. In fact, they can die if the temperature gets too high partly because they can't sweat to cool themselves. A good rule of thumb is to add the humidity and temperature together. This number should never exceed 150. We try to keep our chins in a room that doesn't exceed 75 degrees. This gives us a little buffer. Chinchillas also like to chew on things. This includes doors, baseboards, and wires. Be sure to protect these areas with cardboard, wood, or plastic. And finally, since chinchillas are crepuscular, you should keep them in an area during the day where they can sleep. No need to keep them in the dark. In fact, daylight will allow them to sense when to go to sleep and when to wake up. We keep our house usually at 70-75 but also with school starting back up for my kids and me working it's hard to purchase the chinchillas toys and play with them everyday. We have two chinchillas so they don't ever get bored but can't they go 3 days without human interaction? Keep her in the coolest part of the house. 83 is pretty high for a chin. Purchase a chinchiller, the marble pad you can cool in the refrigerator, to help her keep cool. The younger chins should have their activities limited when it is hot. Hello my chin is about 6/7 years old. I just adopted him last year and I am coming to a time where school is demanding a lot out of me. I really do not want him to get bored so I was thinking about getting another male chin for him to play with? I have a rather big cage. It's two stories, about 5 or 6 foot all I would say. Is it a good idea? Or is he just too old to be introduced to another chin? And would they fight if in the same cage? This evening i found a chinchilla eating on my window ledge. Its winter and i live in B.C. Canada. It keeps coming back to my window at night for the last 2 days. Any ideas on how to bait him in to catch him? I dont want him to die. Just need to figure out how to draw him in? I have never seen one before tonight, and have been on goole for last 3 hours .... How do i catch this little guy? And what should i bait him with? Or can i? Help! Open the window! They like carrots and raisins. Not bad at all. Just make sure to order a chinchiller. I think that's what it's called. It's a granite slab that chinchillas cool down on. Prolonged exposure to temperatures above 75 can kill a chinchilla. They have extremely dense fur but very little body fat which is why they can not be in very hot or cold climates. Yes that is too high of a temp for a chinchilla. They need to be kept at a temperature of 60-70 no higher then 70. They also need to be kept in humidity less then 60. I don’t know what Albus is talking about! Yes.. leaving the window open to invite the chin to come inside is a good idea .. BUT do not leave veggies or raisins to tempt it with. It's actually not healthy to feed them. They can't digest veggies very well and raisins are high in sugar. Anything sugary is a big no no for them. Get things like apple wood or willow wood chew toys or sticks.. nothing with bark or made of plastic.. A great treat that would tempt a chin and is safe for them are rosehips and rolled oats (not the quick cook type). Having a small pile of timothy hay would be a good idea as they need this as their main staple. If you have a Facebook page, look up and join this FB group: https://www.facebook.com/groups/333577573641985/ - they are a very educational and helpful group that will answer any questions to help you with getting and keeping a chinchilla. They may have better advice on how to capture this chinchilla and provide it with a safe and enjoyable habitat. Assuming you are still trying to capture it, etc. I'm thinking about getting a chin, is it preferred if the cage is on the ground or on a dresser? Hi! I'm trying to convince my parents to allow me to get a Chin. This seems like a good website for questions so here I go. I live in Boise ID. We have ZERO humidity, always. But my parents like to keep the house a little warmer, around 75. Can a chin live comfortably in these conditions? Typically chinchillas prefer 72 or below. Anything higher then that can cause stress, and can lead to an unhappy chin. When they run around an exercise they can have heat stroke, and can possibly die. It is especially bad for young chins because until they are 6 months old they do not have a sense of when they need to stop running, which can cause death. If you are wanting to get a chinchilla and your house is over, keep the chin in a cooler area of the house. A basement possibly? That is what I do with mine. Also you can get a chinchiller, a granite slab that keeps your chin cool! I am thinking about getting a Chinchilla, and I was wondering what kind of cage I should get. Should I get a solid cage or one with bars? Bars! Solid cages that I've seen are all plastic, which a chin will love to chew. Also a metal barred cage will allow for better airflow and help ensure their living quarters aren't stifling! After reading your nice article I felt there are a couple things that need to mentioned. It's not good to let very young chins have free out of cage time until they are older and can regulate blood sugar and body temperature more effectively. Some young chins have died from both after being free to run as much as they wanted to. This also goes for a wheel in their cage. Another thing I wanted to mention is the temp/humidity 150 thing. It's not entirely correct that adding the temp and humidity will ensure a proper environment. If the temp is 100 degrees and the humidity is 20% that is less than 150 but will still cause death due to heat stroke. Chins have ranges they can live in comfortably. An ideal temperature is 60°F to 70°F with a humidity level of 40% to 60%. I've recently got a chinchilla and I'm confused about feeding?? He has constant fresh hay and water and I'm giving him a small teaspoon amount of pellet food and a few blueberries or grapes.. it just doesn't seem a lot ?? Also I purchased some calcium sticks that are to aid looking after their teeth and state especially for chinchillas however they are made of seeds and my chinchilla book contradicts this by saying avoid seeds??? I am going to an exotic vet in a few days to get him health checked and I can ask these questions but just wondered if anyone could advise in the meantime please? Chins typically do best on a good quality pellet (aprox 2 tablespoons a day), plenty of timothy hay (fiber and to wear down molars by chewing), and fresh water. No fruits, dried or fresh, nuts, seeds, or vegetables at all. These typically cause digestive upsets, malnutrition (because the chins refuses to eat more nutritious foods), bloat, which can be deadly and tooth rot. Chins also need plenty of chin-safe wood to chew on to wear down their teeth. Either in the form of kiln-dried untreated pine or sticks. Don't feed them sticks or wood you pick up from outside because it can introduce pests and unwanted bacteria into their systems. Also don't feed painted, varnished, or treated wood. Supplements are also not needed if you feed a good quality pellet and hay. Calcium supplements are mostly for pregnant/lactating females. I have a chinchilla that I just got and she's a little shy. She will take treats and is not aggressive. When is the right time to start handling her again? If I chase her around the cage, isn't that bad? I've slowly worked up to the treats and she will sit on my hand, but this is recently. Should I just be very patient until she's more confident being taken out, or take her out because she needs to get exercise and I might be wasting the time I could be handling her and making her more shy of people. It's a Catch-22 to me. My chin is still young. He hates being handled. But I puck him up, and he won't leave me. Remember, these critters are prey in the wild. You want to be known as the safe choice. Be friendly to your chin, and make him like you. It sounds harsh, but it's really not. In a few short days, mine went from chirping every time I got close, to choosing to run to me rather than being in an open space. Chins will seek what they know is safe. hello, at night is it okay for total dark, or should I have a nightlight? Can Chinchillas live below 30 degrees? I will stay at my friend's house for awhile. there will be no room for my pet's cage to put. so I'm thinking about putting cage in balcony with blanket sheet cover the cage. it's snowing now and i'm concerning about my pets. You will probably kill your chinchillas if you leave them on the balcony in the conditions you've described. Please reconsider. No, they can't live in temperatures that low. In the wild chinchilla's natural habitat is between 50 and 55 degrees. Hey everyone! I am in the process of getting a chin, but the temperature situation has me a little nervous. I live away at school, but when I go to pick the chin up from the breeder, it will be the end of july and I will have her home with me for about a month before I head back up to school with her. While I am home, I know my mom is not going to be running the AC every single day unless is gets above 85ish out (just making a guess). I was thinking of keeping the chin in my laundry room which is in our finished basement because it is the only room in the house that has tiled floors. I figured that would help keep her cool. Also I am definitely going to put a few marble tiles in the cage for her to use. Once I get back to school, I can run the AC at about 68 degrees consistently. Any suggestions? Do you think the tiled floors will help? My house is cluttered, so I am planning on keeping chins in the guest bedroom, which we do not use and is a lot neater. We have AC in the summer, but I live in New England, so the winter is generally around 65 in the house and very rarely can drop lower. Anything I should know? The BEST wheel for a chinchilla (made by a vet for them specifically because of how they run) is the Flying saucer. I have had one for over 6 years with no issues and the second for about 3. Awesome advice! Perfect timing for us as we recently inherited a 3 yr old male,named Hammie. After educating our selves some, we realized he has been lacking some necessities.... Wheel being a major one! So thank you, we appreciate savings a buck or two. So, sounds like you know your stuff...any other great tips? ? We have a small dog, 9 and friendly, lives with two cats. Has any one intergraded them at such older ages? They dont like drafts either so a fan should not be directly blowing on them. I got some real granite tile from the hardware store. This granite when they sit on it can help cool them. Get more then one piece so you can clean and dry one and have one in the cage. The hardware store will cut it if you need to make adjustments. Yes my two also love granite and ceramic tiles to sit on. But I have found that it is easier to clean the tiles with a straight edge razor knife. You can get them at any hardware store and it really works well to scrape off any food or feces residue before you wash the tile. my chinchilla doesn't bark allot and i herd that they are suppose to bark frequently.mine only barks about at the most three times a month should i be worried about this? No need to be worried. I heard before we got ours that they are noisy but ours only barks when he sleeps. I think he has nightmares. But he is perfectly healthy. you got your temperature wrong. it should not be above 70. when it gets above 70 they get uncomfortable. when it gets above 75-80 they can over heat and die. ideal temperatures are between 60-70. please do not tell people false information that will end up killing their beloved pets. Your wrong also. Its anything above 75 degress. Mine have lived in summer heat and is okay with even 80 degress. Ask most breeders and rescues - they will also say 75 is the highest before overheating can start becoming a huge issue. No, they cannot get fleas or ticks. No they can't get fleas they have super thick dense fur ... fleas can not get through ... you also can never wet you're chinchilla they can die and get fur rot or fungus ... their fur is to thick to properly dry ..
it is possible but unlikely. if the chinchilla is very poor quality then the fur will be thinner allowing fleas. most chinchillas will never get fleas however because their fur is too thick. Chinchillas can never get fleas. Their fur is too thick. Fleas often suffocate in the amount of fur they have. Yes, they can get fleas though not like we think. Because their fur is so dense they won't get fleas in their coats but they can around the edges of their paws and ears and the base of their tails. I recently bought three male chinchillas from a breeder. I've been told (and also read) that plastics and cardboard are unsafe for chins, as it can be toxic and/or block their intestines. 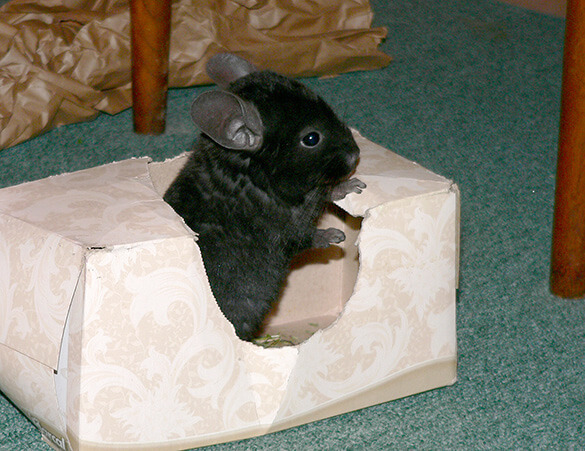 Have you experienced problems with your chinchillas from placing cardboard boxes in the cages? I think the boys seem rather bored in their new cage, so I'm searching for additional tunnels, chew toys, and possibly a wheel... but I don't want to get anything that will harm them. You can use cardboard for playing (although I hope you're letting them out of the cage for some play time as well) in their cage as long as they do not chew it. If you see a few nibbles, that's probably okay, but is you see a chinchilla constantly chew at it, it should be removed. It's the same with PVC pipe which can also be fun for them to play in. Would it be alright to keep a chinchilla next to a radiator? It is on most of the time at about the normal temp. No, this will cause them to overheat double time. Can anyone tell me- I have a dog but I might want to get a chinchilla... Do they get along? I know a chinchilla doesn't like loud noise, but our dog is bouncy, not noisy, and he wouldn't be exposed to him. My dog is a black labrador puppy, the hunting breed. So he tracks scent really well and is skinny so he can run really fast! Will they get along? Thanks for any help you can offer! Do you mean get along as in playing with each other? Chinchillas have extremely fragile bones and one pounce from even a puppy can break them. Also chinchillas are prey animals and typically view other animals as predators. I don't think your chin will have much fun at all romping with your puppy. But if you mean just co-exist in the same house then yes as long as the dog doesn't view the chin as prey and bother it. I have a chin and a dog and they don't mind each other. Your post is so cute! It seems like you have pretty much everything in order... The best temp for them is between 65 and 80 degrees... they are prone to heat stroke (as im sure you know) so don't keep them in places of high heat or humidity. Because of their sensitive digestive tracks they can't have to much sugar or high protein treats (and you should avoid all milk products) but they love raisins and dandelion drops, as long as you only give treats to them infrequently. It seems like your doing a great job though, so keep it up! And, congrads on your purchase! One excellent resource for learning is a forum called chins-n-hedgies.com Most of the posters there are very experienced in caring for chinchillas and have so much good information to offer. One thing I'd suggest is to find an exotic vet that knows how to treat chinchillas. They have very specific needs that an average cat-and-dog vet won't know how to treat. No that is a horrible idea he would surely die within a year, highs should never be above 80. Is it ok if a chinchilla lives in a cage outside? Where I live has fairly cold winters that regularly drop below 20 degrees farenheite and mild summers that rarely ever get above 90 degrees. there would be plenty of shade from the sun and shelter from it getting snowed on. the chiinchilla should deffinetly NOT be outside.... it'll freeze and die or get overheated and die!!!! their fur is the thickest of any animal...20,000 hairs per square inch. do you have cats where you live? rain is more easily blown a different direction (other than strait down) due to the wind, chinchillas dont get wet....not even for bathing, they use dust (as you surley know) if you what to buy a chinchilla and put it OUTSIDE you're waisting your money and killing an inocent animal. besides how would you like it if a giant came and plucked you out of your nateral habbitat, away from your family and friends, and put you in a cage? would you really care if it was outside or not? I don't really get what you're saying, but wild chinchillas are illegal to take for any reason. All the chinchillas sold now are domesticated - they live in cages and some play time out of cages, but NEVER outside. Please do not leave a chinchilla outside in a cage. It makes me sad to think that you would want to get a pet just to leave it outside alone to be too hot or too cold. How about you dont get an animal because you really do not seem to understand the needs of most animals. That is some intense abuse and i hope if you do this with your chinchilla someone reports you to the police before you kill an innocent and loving animal. My heart hurts just for your ignorance towards the needs of animals and the possible abuse you may inflict. Yes ask questions, but think about it; would YOU like to be left outside all the time in a weird place all alone? No. Well an animal wouldn’t either. Its common sense! I have to wonder if either of you finished Kindergarden. -1. Say something nice, or don't say anything at all. -2. There's no such thing as a stupid question. A person asks a question because they generally want to know the answer, not because they want someone who thinks they're high, mighty, and better than everyone else to barate, embarrass and ridicule the questioner. Replying to this post is a waste of your time; I seriously doubt I'll be returning to this website. My sister has a chinchilla and he is up against a wall but not in a corner and his cage isn't the greates but i was wondering what i could do to make it better for him and in thinking so i was wondering if it would be alright to put a pinecone and maybe some good sized sticks from a cotton wood tree for him to jump around on and such. I have looked and looked over stuff on the web to see if it would be ok but i still haven't found anything, then i came across your web page and was wondering if you could help me. I would be glad for a few pointers on how to get him socialized with humans because he refuses to come out of his cage. Pinecones have some kind of special preparation they need done before chinchillas can have them, so I would say no to that. However, as long as your cottonwood tree is pesticide and fertilizer free, it would be okay if you make sure the sticks are clean (dirt, moss, etc.) and then bake them in an oven! Vickie, it's awesome you want to improve your chin's environment. There's a site called chins-n-hedgies that have some really great ideas for cages and such. what if it likes chewing the walls? Then don't let it do that because the walls are probably varnished or painted. I have a question, i live in southern idaho, its quite cold in the winter but can be a little hot in the summer. would that be alright? If the temp in your house is an average 65-75 then it will be fine. ok, so im new to the whole chinchilla thing and the one im getting is still with his mother and he was born on march15 im bringing him home next week and i need advise! im prepareing his cage based on the info from your website. plz tell me what to add to make my home fit my chinchillas needs. The one suggestion that I can make is to find out the brand of bedding and food the breeders are using and use that for your baby. This will keep the stress level down as its less things that are different after the move. i have a question on where i live. i live in hawaii and i get alot of sun so my house is sorta warm but if i leave my door open and my window wide open cool air would go threw but also the sun shines too so its like a bit warm . so i was thinking that i could make a fan cooller to cool down the chinchilla would that still be fine? Hawaii isn't as hot as it is humid. You have to take the air temp and see. Chinchillas are from the mountains so they like it on the cold side, and they don't care for humidity. You'd definately have to increase their dust baths from 3 times a week to maybe even every day. You could get a marble slab, probably several of them. You freeze the marble slabs then put them in the cage. The chinches sit on them and rub their face on them. Use the average air temp as a guide to see if your home is cool enough for a chinchilla. I live in New York and I have to watch the temp/humidity here. We have a room for our chinchillas and have set up an a/c that runs pretty much from May to September to keep it constant for our chins. Come the hottest months here we use the marble slabs chilled in the freezer to keep the chinchillas even cooler. If you get a chinchilla a fan may work for some days, but i would keep an a/c on hand just in case it gets to hot and humid one day. Unfortunately not. But won't careful handling in this way at least cause them less stress than the heat? Maybe they will accept this as a routine when they see I am moving them to a more comfortable place? Moving your chinchillas between cages could easily stress them. Is there no way to dismantle the large cage to bring it inside? I just bought two chinchillas and a very large cage. The cage is too large to bring inside our house so I planned on keeping it cool with large tins filled with water and then frozen but today I realised that the tins are doing almost nothing for the temp. in the cage. I decided to move them into a smaller cage and bring them inside. Will this stress them out if I do this every time it gets hot during the day? Unless you're a deep sleeper, your chinchilla is likely to keep you awake at night. Chinchillas are active at night and sleep during the day. They're particularly noisy when they run in their wheel. I'm getting a chinchilla pretty soon, but I'm still undecided as to where to place his cage. I was thinking I would put it in my bedroom. The only problem: my small dog (a Yorkie) likes to sleep on my bed at night. Would it be a bad idea to have my Yorkie and chinchilla in the same room? I think it'd be safe to say that a chinchilla can handle any cool temperature you can handle so I wouldn't worry about it being too cold in your room. Some chinchillas like hammocks, but I haven't seen them use swings. They do like wooden perches though. I just bought my first chinchilla and I read that they like cooler temperatures not to exceed 75degrees. What would be to cold. My room is like an ice box and is the coldest in my house. It ranges from 68-71 degrees. Is that ok? I had a ferret a long time who got sick because it was to cold. Also do chinchillas like those swings that ferrets and sugar glider use? Or any type of pouch or something? Sorry for taking so long to answer you. Hopefully you've figured out where to put the cage by now. If you provide your chinchilla with some protection against the breeze (like a wooden house) that should be fine. Better to keep your chinchilla cool by the window. Make sure the cage isn't exposed to direct sunlight though as that will really warm it up. hi, im getting my baby male chinchilla in a week and im having abit of trouble working out where to put the cage. i know they do not like drafts, and you cant put them where it would be uncomfortably warm. it doesnt get very windy where i live and i wondered if it would be better to put him under the window, where it would be cooler but maybe a slight breeze now and again, or on the opposit side of the room where on the night it may get warm. please help me! thanks, Kimmey. I have 2 cats and they do get alone with my chinchilla he jumps on her back and lays on her and the other cat he just runs after it really kinda of funny. When he see the cat he has to get out of his cage and they run after each other. MY chinchillas cage is all ways open he comes and goes as he pleases. The only time I lock up the cage is when I not going to be home for a few hours. If you call my chinchilla he will come when he is called. The only thing that I worry about is he like to have a caption crunch. he will set right bye my daughter when shes eating at just wait for one or two to fell and he takes it and runs with it to eat it. I all so trained my chinchilla to use the letter and he does use it. Takes a lot of time but you can train them they are very smart and very happy little animals. We generally advise against mixing chinchillas with other pets. Some have had success, but there really is no way to know ahead of time. I have two Newfoundlands and want a chinchilla. My dogs are well behaved and will not bug anything small and furry if you tell them it's a "baby". Should I still be concerned with it's safety and well being? Hi saving Grace, my chinchilla is a class pet. He has a cage at school and at home, I take him back and forth. He had become it seemed agitated and did not want me to touch him. I found out that one of the parents was teasing him and chasing him around the cage. That school year ended and he went home for the summer. It took a lot of patiences and soft touching and voice to bring him back to his sweet self. Sorry, but we're not going to be much help in this matter. We haven't had any experience with such a situation so anything we say would be pure speculation. But we do wish you success and hope everything works out! I have a friend who has a chinchilla. I have done a great deal of research on them and was wondering if one that has been badly frightened can be rehabilitated back to being friendly... She was badly traumatized (STILL not sure of exactly WHAT happened) by some of the kids in the family and my friend and his wife are contemplating getting rid of her because she is no longer people friendly... I was thinking about taking her in and rehabilitating her (my husband and I have no kids) if its possible to do so, would you be so kind as to send me anything you can find on the rehabilitation process and the best way to go about it?? Yes. Just like almost any animal, chins can be rehabilitated from past trauma to become people friendly again. It takes TIME and PATIENCE! Do not rush your chin. You have to show them that you are a safe haven so to speak. Try offering treats (though very sparingly) and sitting next to her habitat just speaking softly to her. As with humans, this seems to have a soothing effect. You have to let the change be on their terms. Rushing them will only stress them out and may cause the people aggression to become even worse. Don't reach into her habitat and try to force here's to let you pick her up. Try opening the habitat door into your lap and holding a treat in your fingers at the opening. It will take time, but chins are naturally curious animals, so she should eventually come to investigate and start to nibble the treat. Over time, she will come to associate you with being a safe place. Just be patient with her. She will come around and develop a love for you. They are truly amazing little beings...and totally worth the wait and effort. You won't likely have to worry about your chinchillas being too cold. They do come from fairly cold environments and even domesticated ones should be OK in a basement. More important to consider is whether you can keep the temperature below 75 degrees in the summer. And keeping humidity levels low would be good too since basements tend to be damp. No sun should be OK, but some way to simulate daylight might keep a chinchilla's internal clock synchronized. Admittedly we haven't read much about doing this so we're only speculating about the need for simulated daylight. im thinking about getting a chinchilla. I live in massaschusetts though so the weather gets pretty hott in the summer and pretty cold in the winter. there is a possibility i could keep it in the basement but there wouldnt be any sunlight...but it would be cooler in the summer and warmer in the winter. what should i do? Hi, I was thinking of getting a chinchilla and l have a question. The best place to keep the cage in my house is the basement, where there is a fair sized easily chinchilla proofed room, and no disturbances during the day while the chinchilla will be sleeping. My question is this: could it be too cold? It gets awfully chilly down there in the winter. Would a chinchilla be okay in temperatures that are too cold for me? Thanks bunches! Hi. Does anybody know where to buy a good wheel. My wheel seems kind of small and I wanted a metal one. Also, I would like to know how to build one. Please respond quickly as possible. Hi, I can tell when my chinchilla gets stressed he makes this noise like a dog whining. Also they say their hair will come out. How do you know if a chinchilla is stressed or not? Or bored and just not up to do stuff? Hi Bobby. Chinchillas are extremely sensitive animals and can get stressed easily. One way they show stress or boredom is by fur chewing. Typically this appears around their hindquarters and looks like someone used scissors to cut their fur. Another way to know is the chin will just sit for long hours instead of being active. They can suffer from depression just like people can. Chinchillas need a large enough cage to move around in plus some out of cage time in a chin-proof room keeps them happy. Chins also love to chew wood, so having plenty of wooden ledges, chew sticks made for chins and wooden boxes to hide and play in will help alleviate boredom. Not sure what you mean when you say the chin is 'not up to stuff' but this could be a sign of illness or improper nutrition. A chin's diet should be 75% hay and 25% pellets, fresh water and chinchilla safe wood to chew on. Very very little treats - no dried or fresh fruits or veggies, no nuts, no raisins. No people food of any kind, no dairy or meat-based foods because they are strictly herbivores. These things can make your chin sick and then it will just sit around feeling horrible. Be careful of what you buy in the store because not all things marketed for chins are safe for them. One example is yogurt drops, these things are like poison for a chin. Dried pesticide-free rose buds and rose hips (crushed with hair and seeds removed) are good treats, but only one a day. Chins can be such goody hounds and some will refuse to eat nutritious food when they know they'll get treats instead. Yikes! 18 degrees is really cold. Chinchillas are built for the cold, but that's too cold even for them. Now a group of them huddled together in a small enclosed space can probably deal with temperatures that low, but you really should look at keeping them in the high-60's range. Remember also that they're nocturnal which means they'll be up and about at night when the temperatures are usually the lowest. Can chinchillas get too cold? I was keeping mine in a room with no heat and it got down to 18 one night. I live in a mobile home in central Alabama. I have tried to get an answer for that, but can only related an experience I had with a wet chinchilla. My son had put our first chinchilla in the bathroom to play but forgot to put the lid down on the toilet. We collected her tunnels and boxes to play with and went back to the bathroom to find her trying to get out of the toilet. That poor girl shivered like you wouldn't believe. I wrapped her in towels and I put her in my shirt. I used baby blankets as well but nothing I did stopped her shivering, even after she was dry (which took a long time). So I would have to say that is probably one reason to keep them from getting wet. Chinchillas can vary. I have 7 chinchillas and their weights range from 450 to 625 grams. I have seen some breeders whose chinchillas are the same size as mine and I've seen another who didn't have a chinchilla under 650 grams. They can get up to 12" long (not including tail). What we've read is that chinchillas lack the type of hair that many other mammals have that facilitate proper drying. As such, a wet chinchilla will have fur that remains moist enough to allow fungus (ringworm) to grow. Why can chinchillas not bathe in water? This has baffled me for years and I have 2 chinchillas! Their fur will mold if wet. Thats why you must avoid them getting wet at all costs. It will kill them. Pam, Their fur does not mold. Chins shouldn't get wet because their fur insulates them and getting wet can cause them to get cold and cause pneumonia. Because their fur is so dense they don't have a proper way of drying off. The water stays in their fur and can cause bacteria which can make them sick. If you NEED to bathe your chin then you must blow dry (without heat) and make sure your furball is nice and dry. How big do fully-grown chinchillas get? Depending on gender from 1 pounds to a couple pounds. Assuming you plan to keep your chinchilla indoors, we don't see a problem with having one in Alaska. The same issues apply as they do in any other location. They need a quiet area during the day to sleep, a place to run around at night, cool temperatures below 75, and protection from direct sunlight. I'm getting a chinchilla, and I did a lot of research about the climate and a chinchilla but I'm not sure a chinchilla could live where I live, in Alaska. Do you think it could?